EL CAJON, Calif. (AP) — Police in the San Diego suburb of El Cajon shot and killed a black man a minute after arriving near a strip mall to investigate a report of a mentally unstable person walking in and out of traffic, an official said Wednesday. El Cajon Police Department spokesman Lt. Rob Ransweiler said two officers arrived at the scene at about 2:10 p.m. Tuesday. Ransweiler says the shooting happened at 2:11 p.m. He said police received the report about the mentally unstable person at 12:57 p.m. but did not immediately respond because they had other calls for service. Police have said the man refused to comply with instructions to remove a hand from his pants pocket, paced back and forth, then rapidly drew an object from the pocket, placed both hands together and extended them in a "shooting stance." The officers simultaneously fired a handgun and an electric stun gun. 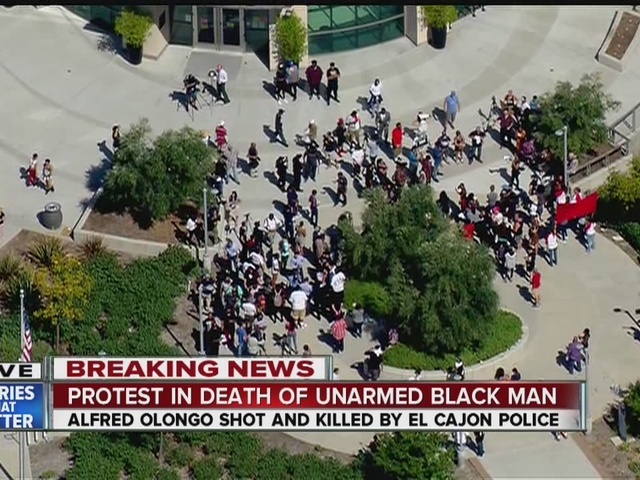 The victim was identified as Alfred Olango, a refugee from Uganda, as dozens of demonstrators protesting his killing gathered outside the police station in El Cajon, holding signs that read "No Killer Cops!" and chanting "no justice, no peace," and "black lives matter." The man died after one El Cajon officer fired an electronic stun gun and another officer simultaneously fired his firearm several times, El Cajon Police Chief Jeff Davis told reporters at a news conference late Tuesday night. Davis did not describe the object, but he acknowledged it was not a weapon. Christopher Rice-Wilson, associate director of the civil rights group Alliance San Diego, questioned why one of the officers felt non-lethal force was appropriate while the other did not. Both officers have been put on administrative leave while the incident is investigated, per department policy. Rice-Wilson was among those who identified Olango on Wednesday. Police Lt. Rob Ransweiler said he could not confirm the victim's name but said he was in his 30s and believed to be from Uganda. Some protesters said Tuesday night that Olango was shot while his hands were raised in the air. Police disputed that and produced a frame from a cellphone video taken by a witness that appeared to show the man in the "shooting stance" as two officers approached with weapons drawn at a strip mall. Olango often hung around the strip mall and at times seemed "agitated but he was never aggressive toward me," said Vincent Hauer, who works at a nearby convenience store and sometimes bought the man food or gave him a few dollars. "This will be transparent," he said. "This will be looked at by multiple sets of eyes, and not just ours." Police said they were called to the strip mall shortly after 2 p.m. by the victim's sister, who said he was "not acting like himself" and walking in traffic. The man refused "multiple" orders to take his hand from his pocket, then was shot after pulling out the object that authorities declined to describe, police said. "I said: 'Take your hand out your pocket, baby, or they're going to shoot you.' He said 'no, no, no,' " the woman said. "When he lifted his hand out ... he did have something in his hand but it wasn't no gun, and that's when they shot him." Another woman on the video wearing hospital-style work clothing identified herself as the victim's sister. She shrieked and cried, telling officers that she had called them to help her brother, who she described as mentally ill.
"I just called for help, and you came and killed him," she said. The officer "let go of the trigger and shot him again and again," Rodriguez told the San Diego Union-Tribune.